A safety rail or railing at a convenient height to be grasped by the hand . Used on stairs, landings, platforms, elevated ramps etc. 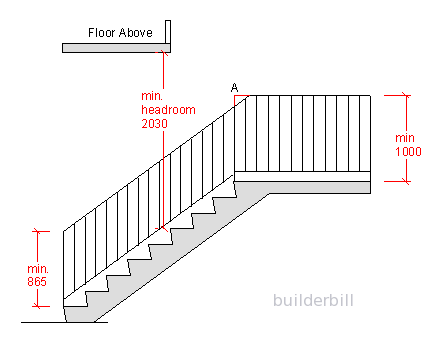 The minimum required height of any floors or bulkheads above a staircase. The main point behind these rails is that they are there for safety. To stop someone from falling down a stair, to stop someone from falling over a balcony or to just assist older people and give a sense of security. The sketch at the side illustrates some points from our building regs in Australia in the BCA. Your regulations may differ slightly. The height of the sloping section of a stair handrail is measured vertically from the nosing line and it should be a minimum of 865mm. 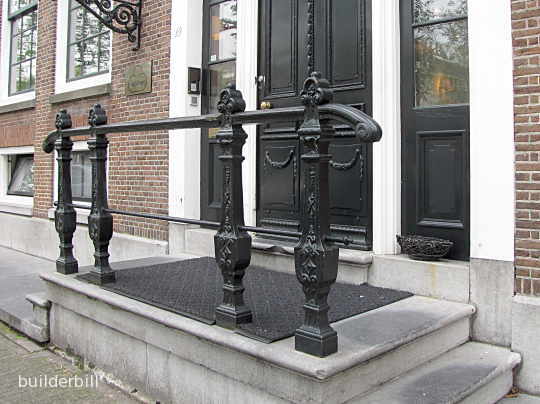 The height of horizontal handrails to balconies and landings should be a minimum of 1000mm. Note! A few years ago this height was different, in fact the regs have changed twice while I have been building handrails. As far as I know there is no compulsion by authorities to force homeowners to upgrade to the new heights, but a lot of rental properties have been upgraded for fear of litigation in case of an accident. The small triangle at "A" or Transition Zone where the sloping and the horizontal rails meet at the top of a stair has long been a bone of contention between builders and regulators (or to be precise, only certain hide bound building inspectors). In recent changes to the BCA we can now dispense with the triangle, so we can now make a smooth transition from one to the other without the annoying vertical face. See the photo below and the page on goosenecks. 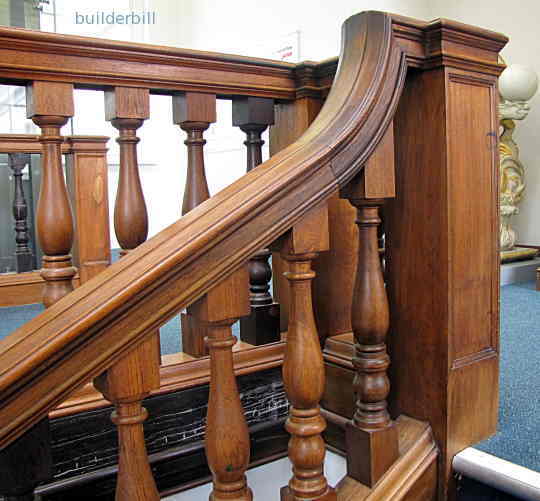 A hardwood stair handrail showing the vertical or gooseneck section previously mentioned. In certain case on stairs and ramps it is advisable (but not specifically regulated in private homes), to fix wall mounted rails. These come in various styles with different methods of fixing. In situations like this where a doorway has a landing outside it and that the drop is less than 1m then there is no need for a landing inside private property, however as this is on a public street then it would be required.